Not all user accounts last forever. It’s always a good idea to purge your MacBook of any unnecessary accounts. Students graduate, coworkers quit, kids move out of the house (at last! ), and Bob might even find a significant other who has a faster cable modem. In the user list to the left of the window, click the account that you want to delete. Click the Delete User button (which bears the Minus Sign of Doom). OS X displays the confirmation sheet. Note that the contents of the user’s Home folder can be saved in a disk image in the Deleted Users folder (just in case you need to retrieve something). Alternatively, you can choose to leave the deleted user’s Home folder as is, without removing it. If you’re absolutely sure you won’t be dating that person again, select the Delete the Home Folder radio button (which doesn’t save anything in the Deleted Users folder). You regain all the drive space that was being occupied by the contents of the deleted user’s Home folder. 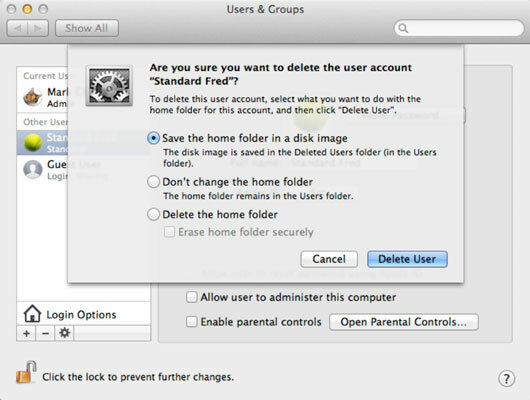 As an extra measure of protection, you can also choose to securely erase the contents of the deleted user’s Home folder. To delete the account, click Delete User. If you’re not sure, click the Cancel button to abort and return to the Accounts list. Always delete unnecessary user accounts. Otherwise, you’re leaving holes in your laptop’s security.